Are you going to be traveling out of the country? If so, it is important to take your health into account before you leave. Many foreign countries have a high prevalence of diseases that can be easily prevented with the right vaccinations. 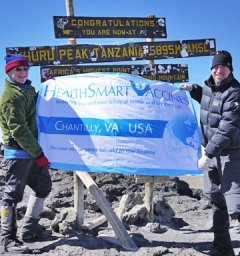 HealthSmart Vaccines of Chantilly, VA, administers common vaccines for illnesses like influenza, but they also carry many travel vaccines for those who venture outside of the U.S.
India: Hepatitis A and B, Typhoid, consider Japanese Encephalitis for travel to rural areas, planning an extended stay, and the time of year. Don’t let this list scare you; traveling is a rewarding and exciting opportunity. But it’s very important to be prepared for any and all possibilities when it comes to your health. Millions of people every year travel the world and expose themselves to vaccine-preventable diseases. Those at the highest risk of contracting one of these diseases include adventure travelers, scuba divers, backcountry hikers, and people who stay in hostels. Do not make yourself susceptible to a preventable illness—get vaccinated today. For more information on vaccine-preventable diseases, to make an appointment for vaccinations, or for information on travel insurance, call HealthSmart Vaccines in Chantilly, VA, at (703) 961-0733.